The Arctic Ocean could be largely ice-free and open to shipping during the summer in as little as ten years' time, a top polar specialist has said. "It's like man is taking the lid off the northern part of the planet," said Professor Peter Wadhams, from the University of Cambridge. Professor Wadhams has been studying the Arctic ice since the 1960s. He was speaking in central London at the launch of the findings of the Catlin Arctic Survey. The expedition trekked across 435km of ice earlier this year. Led by explorer Pen Hadow, the team's measurements found that the ice-floes were on average 1.8m thick - typical of so-called "first year" ice formed during the past winter and most vulnerable to melting. The survey route - to the north of Canada - had been expected to cross areas of older "multi-year" ice which is thicker and more resilient. When the ridges of ice between floes are included, the expedition found an average thickness of 4.8m. Professor Wadhams said: "The Catlin Arctic Survey data supports the new consensus view - based on seasonal variation of ice extent and thickness, changes in temperatures, winds and especially ice composition - that the Arctic will be ice-free in summer within about 20 years, and that much of the decrease will be happening within 10 years. "That means you'll be able to treat the Arctic as if it were essentially an open sea in the summer and have transport across the Arctic Ocean." According to Professor Wadhams, faster shipping and easier access to oil and gas reserves were among short-term benefits of the melting. But in the longer-term, losing a permanent feature of the planet risked accelerated warming, changing patterns of circulation in the oceans and atmosphere, and having unknown effects on ecosystems through the acidification of waters. Pen Hadow and his companions Ann Daniels and Martin Hartley endured ferocious weather - including a wind chill of minus 70 - delayed resupply flights and starvation rations during the expedition from 1 March to 7 May. 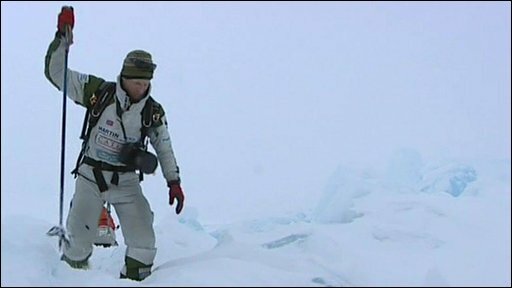 When I met them on the ice, as part of a BBC team that joined the pick-up flight, all three had lost weight and were evidently tired from the ordeal. The expedition had been blighted by equipment failures. A pioneering radar system, designed to measure the ice while being dragged over the ice, broke down within days. Another device to measure the water beneath the ice never functioned at all. The technical breakdowns forced the team to rely on hand-drilling through the ice which slowed progress and meant the team's planned destination of the North Pole had to be abandoned. Pen Hadow admitted that the expedition had not led to "a giant leap forward in understanding" but had been useful as an incremental step in the science of answering the key questions about the Arctic. His view was backed by Professor Wadhams who said the expedition had provided information about the ice that was not available from satellites and that no submarines had been available to science at that time either. Pen Hadow said he was shocked by the image of how "in my lifetime we're looking at changing how the planet looks from space." He also described how polar explorers were having to change their methods from the days when sledges could be pulled by dogs over the ice. "Dogs can swim but they can't tow a sledge through water which is what's needed now." "Now we have to wear immersion suits and swim and we need sledges that can float. I can foresee needing sledges that are more like canoes that you also pull over the ice."